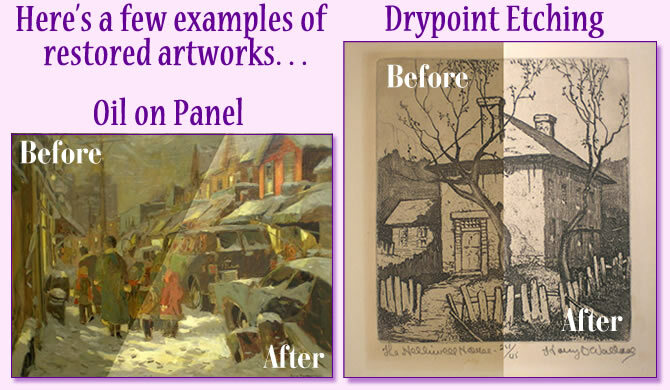 Could your favourite painting, etching or woodcut, after decades of neglect and enduring the sometimes adverse conditions of 'Life On The Wall', now be in need of some vital restoration or rejuvenation? Let us assist with the careful cleaning, varnishing and restoration of your 20th century oil or acrylic painting, or help with the cleaning and conservation of a fine hand-pulled print, and bring new life to your treasured artworks. We are dedicated to consistently use the finest quality materials and apply the most appropriate conservation techniques during the process of restoration. From the meticulous preparation and handling of your artwork, to its completion, we are committed to satisfying the eye of even the most discriminating art collector or gallery owner. It's important to note, our restoration services apply specifically to oil and acrylic paintings and hand-pulled prints produced with oil-based inks. Unfortunately, we do not clean watercolour paintings, ink drawings or any other water-based-medium artworks. As this type of cleaning and restoration technique requires an alcohol based process where the results can often be very unpredictable. A professionally restored artwork reflects its original strength in terms of general definition, color vibrancy and form. Does a work loose in value once it is restored? On the contrary, a professionally restored artwork retains its value. A potential buyer will have no reason to question the artwork’s price. Restoration and conservation can be seen as arresting the changes of time. Restoring an artwork also preserves the memory of the artist's eye. The beauty and vibrancy of a restored artwork psychologically enriches our lifes overall. Restored prints, whether it's an etching, aquatint, woodcut or litho take on a new life with more clarity and brilliance, and also increase in value. All prints restored by us are chemically treated to buffer against any future damage, such as mould and foxing. Contact us through an email with your basic query about any art restoration. Then email us all relevant photos. We then respond with a full description and cost estimate for your restoration work. Payment can be made by preferred eTransfer or by Visa or MasterCard. Upon completion of the restoration work we will notify you shortly after that the artwork is ready for shipment or pickup by you. Contact us about the restoration needs for your artwork, and give us a few details. Go to our Contact Page to find all of our relevant contact information. Upon hearing back from us you'll need to take photos of the work or works you want an estimate for and email us your photos. Include photos of the frame and all parts of the art work in question. Photo both the front and back and close-ups of all damaged areas and anything that may be considered relevant to the restoration process. Due to the fact that every piece of art that we handle often has its own unique issues, we must give individual quotes. After a thorough inspection of your photos we will then respond with a cost estimate of the work needed, including return shipping and the instructions on how to proceed. Client drop-off and pickup can also be arranged. Next, If you agree to the terms, arrangements can then be made by you to have the artwork, minus its frame if you prefer, shipped or hand delivered to us. In the case of framed prints, extreme care is advised if you chose to open the frame from the back and remove the vintage print yourself, or you may chose to leave that delicate task for us to handle. If shipped to us with glass intact in the frame, be sure to securely cross-hatch the glass with masking tape for safety during transport. Payment can be made by preferred eTransfer or by Visa or MasterCard. When your artwork arrives at our studio and after examination, you will be sent a printable pdf E-Invoice for a 50% deposit on the agreed-to expense of the restoration work. The process of cleaning and restoration does take time, possibly up to 30 days or more and should not be rushed, so please have patience. We will then E-Invoice you when the restoration process is completed and at that time the payment of the 50% balance of your account can be made. Lastly, we will securely package and arrange for the return shipment of your rejuvenated and restored artwork. Individual pickup can also be arranged from our Thornbury, On, location. Please note: We offer fine art cleaning and restoration services to clients residing within Canada, from coast to coast, and we take the utmost care in the handling and return shipping of all the artworks that we restore.